Interlaced Rings make such an elegant braid, using 4 shuttles ! Judith Connors shared her beautiful braid on InTatters in a thread titled “Reverse Stitch”, which I have elaborated on in my previous post on Front to Back movement. The overlap of rings depends on the movement of the 3rd shuttle. If it is passed front to back, then the 2nd ring (on right side of braid) will lie over & under the 1st ring. If the 3rd shuttle is passed from back to front, the 2nd ring will lie under & over the 1st ring. This post is a continuation from the previous one. Here I share how I did the Under & Over overlap of rings, by moving the shuttle back to front. Thread used : Anchor Mercer Cotton size 20. Length of braid : 13 pair repeats = 5 inches. It took less than half a bobbin of each shuttle to tat this length. So fully wound shuttles should give you a length of anywhere from 12-15 inches. Sh – shuttle. Each shuttle is numbered from 1 to 4 : Sh1, Sh2 form one pair ; Sh3 & Sh4 form 2nd pair. DNCR – Do not close ring. Please disregard the 1st pair of rings as seen in Figure 1 below. This was done front to back (tutorial in previous post) as per the photo that Judith had posted. This pair will, however, serve as an immediate comparison for outcome of the two directional movements of Sh3 : front to back & back to front. Notice how in the 1st pair, the green ring goes over & under the yellow ring . However, for back to front movement, the green ring goes under & over the yellow ring ! Update : Here is the detailed step-by-step tutorial for how to begin the 1st pair of interlaced rings. Secondly, many images do not show the shuttle 1 thread clearly; it is outside the frame of the picture on the left side. Mea culpa. I wanted to focus more on the green ring being made for a clear visual of Sh3 thread in relation to others. If you have gone through the Front to Back tutorial &/or tried it yourself, you will have got the hang of it already. 1. 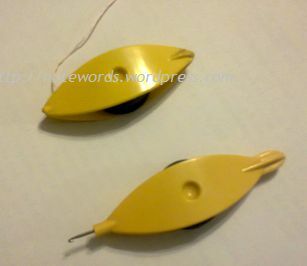 Make Split ring (9/9) with 1st pair of shuttles (Sh1 & Sh2) in yellow thread, but Do Not Close Ring (DNCR) ! It is through this unclosed loop that the adjoining SR will be interlaced. 2. Pass Sh3 through the unclosed yellow ring from back to front. Fig 1. 3. Insert your index finger between the right side of SR1 (yellow ring) & the Sh3 (green) thread. Pull a length of the Sh3 thread from the outside. (The shuttle hook points to which thread needs to be pulled in Fig 2.) This loop will be wrapped in order to start the green ring. Wrap & hold the thread in a pinch to form the core thread of the new ring with Sh3. 4. Make 9ds with Sh3 – 1st half of SR2 completed. Fig 3. 5. 2nd half of SR2 (9ds or RS) are completed using Sh4. Fig 4. Please Note : Needle points to how the SR2 loop & Sh4 thread are on one side (above or on top of) the yellow SR1 ring, while Sh3 thread is on the opposite side viz. under SR1 yellow ring. If rings are closed at this stage, Sh3 & Sh4 threads will not be adjacent to each other & will mar the next green SR. Hence they need to be on the same side viz., on top. This is accomplished in next step. 6. Pass Sh3 back to front a second time in order to bring all components of SR2 in line/on same side, adjacent to each other. This is an important step as explained above. Fig 5. 7. Now that everything is aligned, start closing the rings. (While notating the images, I noticed that Sh3 thread seems to be emerging from within SR2. This could be due to a bad photography angle or an inadvertent mistake. 8. Both rings are closed & all 4 shuttles are now ready to start the next pair of rings. Fig 8. Continue in similar fashion, starting with SR1, for as long as you would like the braid. * Take #1-B shuttle through the opening from back to front (twice) to form the wrap for the B split ring. * Tat the B ring. * Close both rings A and B. * Tat a second ring with pair A, but leave it open slightly. * Take the #1-B thread behind this ring and pass it back to front through the A ring (twice) to tat the B split ring. * Close both split rings. If you follow my instructions above, then Judith's method requires the Sh3 movement in Step #2; and Step #6 can be skipped since it has already been incorporated in Step #2. Hence, the logic & basic technique is similar. Only the timing of Sh3 movement differs. Yet I could not get it right, try as I might. I just could not figure out which loop to pull & how to wrap it in order to make SR2 !!! Sometimes a mental block prevents us from accomplishing a task; but at a future date, this same daunting task comes almost naturally, like ‘what was the big deal’! So patience. Maybe an excuse for a 3rd pictorial post in the making when that happens ?! My hearty thanks to Judith Connors, for this wonderful learning opportunity. That's it for the present. I continued on to make 1+9+3 pairs of interlaced rings (where only the 9 centre rings were done Back to Front) & since I was running out of thread in one of the shuttles, I closed off with an encapsulated cord, hiding the 4 shuttle threads. I used alternating ds & RS to encapsulate 3 threads at a time. Check out the TIPS on working with 4 shuttles & applications of the braid. Judith Connors shared a beautiful Interlaced Rings Braid in a thread she had started on InTatters : Reverse Stitch. The photograph revealed a braid consisting of 2 columns of interlinked split rings. All She revealed was that it was made using 4 shuttles ! Yup, that was our only clue . I did not refer to any tutorial this time ( a self-imposed challenge). What started out as personal memory aid to refer back to in future, has now been converted into a tutorial that I'd like to share with you in the hopes that it may help some new tatters. If there are already some tutorials out there, I’d be happy to include the link(s) in my Resources page. Please leave a comment with any details you may have. Each ring in Column 2 can go over & under the corresponding ring in Column 1 (Front to Back movement of shuttle #3). Each ring in Column 2 can go under & over the corresponding ring in Column 1 (Back to Front movement of shuttle #3). Thirdly, the major part of the tatting process remains the same; it is only while interlacing, that either of the 2 movements mentioned above, come into the picture. And this one step determines how the rings will lie in relation to each other. To avoid confusion, I am posting the tutorial in 2 parts, each part tackling one overlap direction. Update : Step-by-step tutorial on how to make the 1st pair of Interlaced rings is here. 2. Pass Sh3 through the unclosed yellow ring from front to back. Fig. 1. 3. Wrap this Sh3 thread to start the green split ring & tat SR2. Figs 2, 3, & 4 show the SR2 being completed. 5. Now close both rings. Pull on Sh 1 to close SR1, the yellow ring; and pull on Sh3 to close SR2, the green ring. Figs 6 & 7. Fig. 7 : Notice that both pairs of shuttle threads are in opposite directions from each other : both the yellow threads are in front (above), while both the green threads are at the back (behind). * Step #4 : This is an important step because you want both Sh3 & Sh4 threads to lay side by side together. If one forgets to pass the shuttle a second time, then the Sh3 & Sh4 threads will lie in opposite directions, as seen in image below, & will interfere when making the next green SR. (I made this mistake on my very first attempt & had to unwind Sh3, manually pull that long thread through the ring front to back, & then rewind again). Working with 4 shuttles can be quite fiddly with tangled threads to track ! I find that laying the 3 unused shuttles in proper sequence, on a flat surface such as table top or bed, keeps the threads untangled & also helps maintain even tension while working. Simply pull out a comfortable length of thread from the 3 ‘non-working’ shuttles so that they lie separately on the table, without getting in the way of tatting. Judith has another useful tip : To save the shuttles tangling, use a piece of BlueTak (modelling clay) to stick the unused shuttles together. Then swap it over as you change shuttles. There are loads of possibilities for Interlaced Split Rings. * Edgings, Bracelets, Braids, etc. * Placement of colors can alter the look & focus of the pattern. eg. Sh1 & Sh4 with same color while the 2 center shuttles are of a different color. Thus one will have overlap in centre, and a kind of outline at the sides, all along the length. * Add picots, thrown rings, Josephine knots/rings, etc. etc. to make it more interesting. * Add beads along the edges or in the center ! These are only a few that come to my mind. What would You Creative Tatters do ? 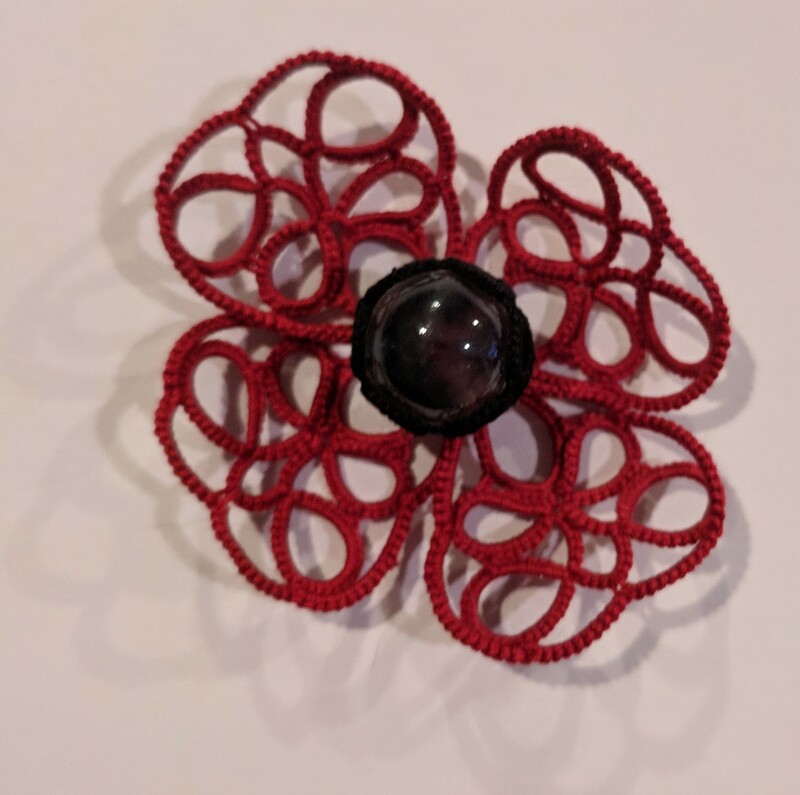 With online tatting resources at one’s "command", there is no dearth of learning that can go on. But what does one do with this new knowledge & skill ? Does one blindly follow existing patterns ? Why not have some creative fun by applying new ideas to old patterns? This is what I tried to do is some small measure, by simultaneously learning And applying. I enjoyed tatting Kersti’s Anastasia Tatted Bookmark for its own sake. But after it was completed, I did not much care for the large negative spaces left by the long chains on top. Fact was that without blocking or stiffening, the long-chained arches were bound to alter their shape. Now how could I fill in the gaps, while staying true to the original elements ? My first thought was little rings. But that would mean snipping out & retatting the purple part with well-placed picots where I could attach the rings. Or if I joined through the chains, it would perhaps not come out neat since I snug my ds pretty close. 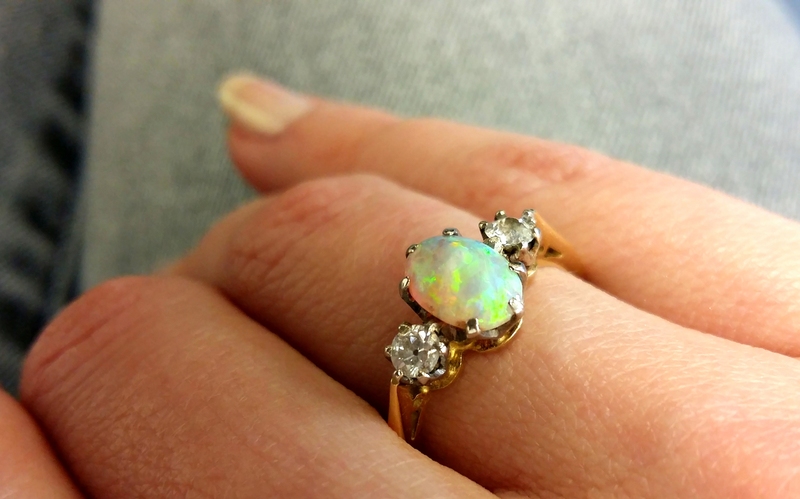 More importantly, the rings would need to lie flat, yet not detract from the beautiful arches. My skills were found wanting. 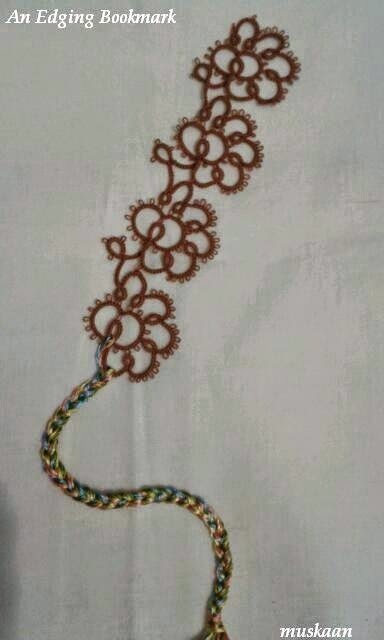 I turned to free-form tatting : Creating a narrow strip of tatting that could be inserted & interweaved through the arches. With the added attraction that it could lend a 3D effect !!! For this, I chose a single strand of very fine gold rayon/metallic thread. Gold is an indispensable part of royalty & all its finery, after all, and what better color than gold for its crowning glory ?! Thread is wound on to 2 shuttles, CTM. The twine is made of simple rings (as leaves), onion/concentric rings (as roses), chains with normal ds & Reverse stitch (for vines). Stitch-counts are entirely up to the tatter. To bring it all together, I covered the tassel knot with gold thread too. The image on right is a scanned close-up of the adornment. TIP : This is a dainty, elegant, feminine design for bracelets, & other jewelry too ! Now here was an edging sampler I’d tatted a while back & converted it into a bookmark, adding a braid & tassel (variegated silk/rayon thread) at one end. I have been using this bookmark ever since. AMC size 20 in Brown - 4054-0355. However, I was not too happy with the tatting & decided to have another go recently, after having learned SLT, Reverse Stitch, & other similar techniques. This time I chose Aqua Blue (4054-0185) in AMC size 20. It was still meh ! Along came a photo on InTatters (by Patty Dowden) where her project had the most perfect circular coiled chains ! She willingly told me that they were all just Long normal chains! What was the fun in simply trying out a chain with no application ?! So I jumped directly into the bookmark, to adorn it as well as to stabilize the fairly ‘open’ edge. First I made some tiny flowers, all from leftover threads in size 20. Each flower has 4, 5, or 6 petals & each petal is a Ring : 3-1-3pds(2)-1-3. Cl. Picots of adjoining rings/petals are joined. Now I loaded my shuttles with white thread & began to tat long chains. It was Such a pleasure to watch the chain coil !!! If you notice, there are gaps in the adornment. Reason is that I just did not know how to proceed & had to cut off the thread. But I gradually got the hang of it & as you can see, the pieces kept getting longer, with more chains & coils, as one descends down the edging. I kept joining flowers to the white chain at intervals and also joined the chain to any picot I could find on the edging. In addition, since there were large negative spaces on the edging, I could slip in the shuttle to intertwine the adornment – under & over. I've included photos of the wrong side to show attachments & intertwining, as well an one close-up. This is still not aesthetically appealing, but it was part of my learning process. TIP : And it is a swell adornment idea for head bands, bracelets, belts, collars, tiara, etc. What do you do when you want to relax ? Practice makes perfect, I hope ! Sharing a few things I've tatted over the past several days/weeks. Since the patterns are already online, I am only adding relevant names & links. Made with size 40 AMC threads, in white & lavender 4054-098. As soon as I laid eyes on her snowflake, I just Had to make it ! Especially since I was dying to use a new ball of lavender thread (I had ordered size 20 but they sent me size 40 - but who's complaining ;-))). I did this in one sitting, referring to the diagrammatic sketch she had uploaded. She intends to name this Isis & will be uploading the detailed pattern shortly. (At present, she has a wonderful tutorial series going on, about designing on an iPad) . I enjoyed tatting this immensely. And this time I added an entire set of needles to my work-box so that I could hide the ends immediately. Tatted with size 20 AMC in Dark Blue 0131 & Purple 0101. For the long tassel-tail, I used Art silk/rayon threads in Blue & Purple shades. This was a slightly intriguing pattern. The lower part was broadening of a common-enough edging pattern, but the upper "crown" was interesting. I wanted to use 2 colors, both representing royalty, hence the combo of deep blue & purple. These were part of my learning process. I loved the way the continuous chains took the shape of a beautiful large rose & also the way the shamrock leaves folded in !!! This could make a very nice brooch or pendant or even a hair-clip ornament ! Or how about appliqueing to any dress !